Recently I have been working on a project with my best buddy Stuart ‘Aq’ Langridge, called BBQpad. I haven’t really talked much about it on my blog as we have been fixing up the rough edges, but I wanted to share a little about it now. As some of you will know, I have been increasingly getting into BBQ as a hobby. I love being outside and cooking, I love cooking over fire, and the art and science of BBQ facinates me. Don’t think there is a science? Well check out amazingribs.com and see just how much detail, science, and engineering can be involved in creating awesome BBQ. One of the tips people give you when you start learning grilling and smoking is to maintain a notebook where you track the details of your cooks. You can then refer to what you did, learn from what works and what doesn’t, and improve your ‘cue. Being of the nerdy persuasion, I was not going to use no stinking paper and pen, so I wrote a web app to track my cooks. Originally I wrote this as something just for me, and then it struck me that this could be of general interest. I was chatting to Aq one day and he loved the idea so we decided to build what you now see at www.bbqpad.com. The sites works on your computer, mobile, and tablet. So what does BBQpad let you do? Well, with it you can create any number of cooks; each cook is a place you track the details of each cook session, such a meal for your family, practicing to improve your cooking, a party for your friends, a BBQ competition, or anything else. Go and see an example cook. Within a cook you can add as many cookers and foods as you need (we maintain a database of cookers and foods to make this easy). The different woods and fuels you use (we maintain a database of woods and different fuel products). When your food is added and removed from the cookers, and we automatically calculate cook time to make it easier to see how longs things take to cook. You can also track rest time for the different foods (if applicable). All your food prep elements such as rubs, sauces, brines, marinades, and more. You can also add general notes about your food items such as the weight, quantity, where you bought it, the level of marbling, whether it is organic (good for veggies) etc. The temperature of your cookers and any food items you are tracking internal temperature for. We use this to plot graphs of your cookers and foods; this makes it easier to track your temperature control and improve things where there are problems. General updates to the cook. As an example, if you spritz your food with apple juice to keep it moist, you can track this and the time when it happened. We also allow you to add photos for the final food products as well as photos through the cook to show how your food is evolving. Photos can be added from your desktop, or mobile devices such as your phone or tablet. 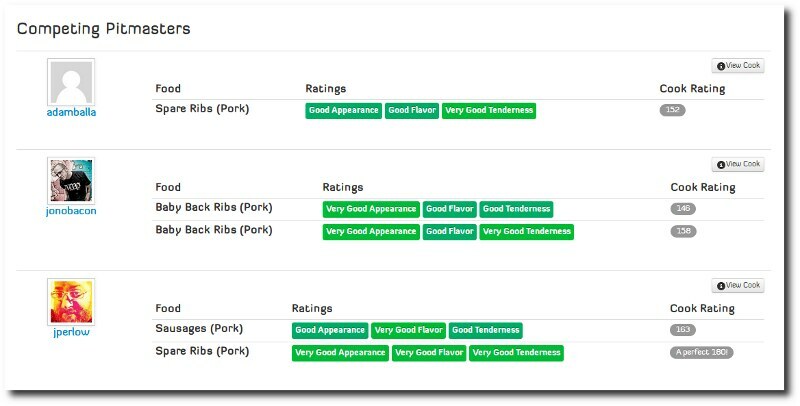 When you have finished cooking an item you can then rate it for taste, tenderness, and appearance; these are the same ways people rate food in a BBQ competition setting. Continuing the competition theme, we then provide a cook score based upon the certified KCBS competition scoring format for each of your food items as well as an overall score for the cook. This provides a neat way of seeing which cooks or items were better than others. One of the goals of BBQpad is not just to provide a place to store cooks, but to also make BBQpad as social as the cooking itself. BBQ is all about cracking open a few beers, cooking some food over fire, enjoying the spoils with friends, and having a great time. 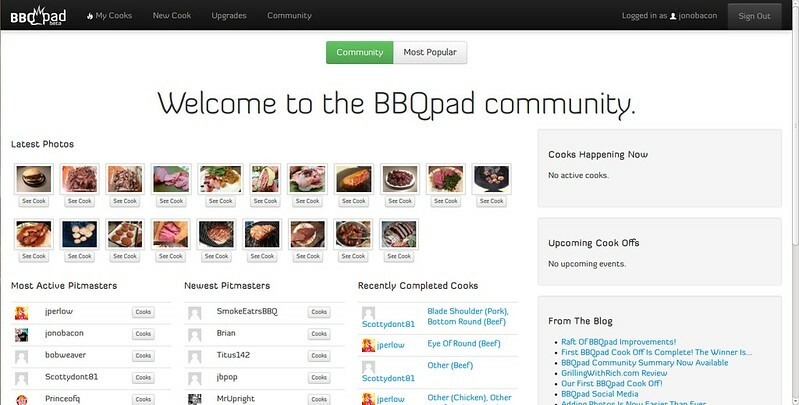 The social aspect of BBQpad is built right into the cooks. On every cook page there is integrated discussion where people can leave comments and offer tips, advice, and other comments while you are cooking. We also have integrated social media to post your cooks to Facebook, Twitter, Google+, and Reddit. One area where BBQpad is really handy is pointing people to the details of a cook. As an example, you may join one of the many BBQ forums/communities online and ask a question about an aspect of your cooking and you can easily point people to the cook page on BBQpad where people can get a good idea of the context of the cook. 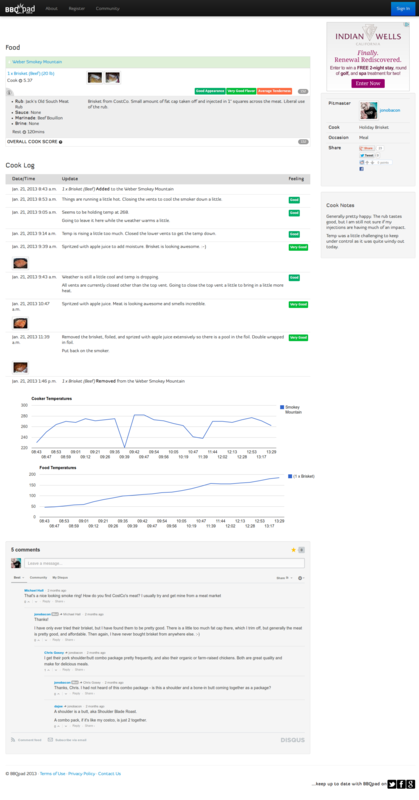 We have also seen many users tweet about their cooks so folks can follow along as they are happening, often leaving feedback and comments on the cook page. Another neat part of BBQ is the community. Here you can see the latest photos from cooks, most active pitmasters, new users, active cooks happening right now, recently completed cooks, and more. The community brings BBQpad pitmasters together. Another feature is the most popular page which shows you the most popular cookers, woods, and fuels that the community uses in their cooking. We plan on expanding this page with other most popular items soon. See what our pitmasters prefer. Clicking on one of these products will also take you to a product page which shows you information about the cooker, the prices on various sites (right now Amazon, but we will add other vendors soon), and a place to have discussion about that product. 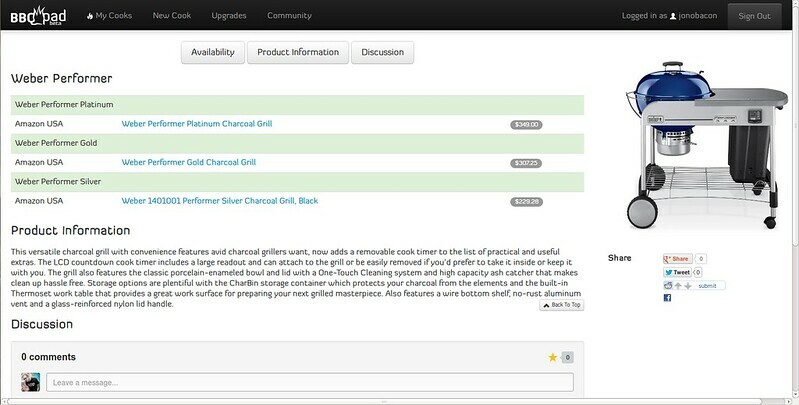 Product information for the Weber Performer grill. Another cool feature that we added recently is the ability to do online cook offs. The idea is simple: there will be a number of cook off events on BBQpad in which everyone is welcome to join and participate in. The cook off will happen on a specific date period and cover a specific food, and pitmasters from around the world will all cook together, tracking their cooks on BBQpad. To take part you simply go to the event page on the date(s) of the event, create a new cook as part of the event, and track your cook in BBQpad. As you and others cook you can see the latest cook updates from these different cooks all in one place, as well as discussion from those watching the cook off. We also encourage those of you who tweet to tweet about your cooks with the #bbqpad hashtag, and those tweets appear on the cook off page too. This provides a great way of cooking together and having fun with the cook off. Congrats to Jason Perlow for winning our first cook off! We also have a few cheap upgrades people can buy. Our view is simple: all cooks by default are publicly available and thus shared with the wider community, and when people provide these cooks we feel they have earned the right to use BBQpad for free. Some folks (such as competition cooks, restaurateurs, or just private people) may prefer to have private cooks so they don’t share their techniques and recipes. We offer private cooks as part of BBQpad Pro (which includes blocking ads) for $24/year, which is only $2/month. You can also just block the ads for $10/year. 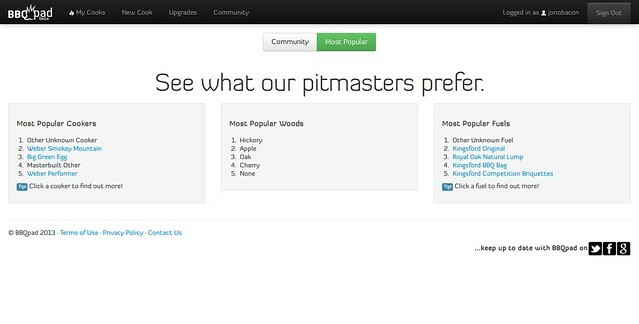 The private cooks feature is pretty cool: you can choose whether cooks are private or not on a per-cook basis, so if you want to use the community features on the site (such as cook offs) you can make those cooks public, but if you want to practice for a competition and keep those cooks private, you can do so with the click off a button. Now, many of you in the technology world who follow me will be curious about the site and how it was built. In a nutshell, we are using the awesome Django platform (and the always lovable Python) as well as Twitter Bootstrap as our CSS library. We are managing the source code with Bazaar and hack on it on Ubuntu Desktop using Geany. All imagery was created using Inkscape and the GIMP. We test across a number of different browsers, and primarily use Firefox for debugging. The site is deployed and running on Ubuntu Server. In terms of development methodologies Aq and I both hack on the site and we manage our work using Trello and drafted and reviewed UI designs using Balsamiq. We have also deployed staging and live servers and we each code review each fix before it lands. The site is currently in beta and has evolved significantly since we first launched it. This has included two rounds of user testing that have proved to be tremendously valuable in refining the user journey on BBQpad. I know some of you will want to know if this is Open Source or not. Right now BBQpad is not Open Source but is a free web service that everyone is welcome to use. We may consider Open Sourcing it in the future, but right now it is not a priority; we would rather focus on adding extra features and refining the site. BBQ is a lot of fun and our hope is that BBQpad makes it even more fun and social. Come and join in the fun! Go and see www.bbqpad.com and follow us on our Facebook page, on Twitter, and in our Google+ community.. I was wondering when you were going to blog about BBQpad 🙂 I should say it is a lovely site and a really good idea. I am not yet into BBQ so have not joined yet. I knew it was Bootstrap from the look of it, but a really good use of the framework I must say. The site looks very pretty in desktop, tab and mobile. I kind of figured out it was Django seeing your questions to developers on Stackoverflow and other forums and I new it was an Ubuntu server as I remember you posting about that too. Ubuntu desktop for development was kind of obvious choice for The Community Manager 😀 and I should say I was wondering what editor you were using. Now I know it is Geany. Great work Jono! Good to see a community being former around BBQ lovers! Very true! Best things in life are free 🙂 Someone said! If I may make a suggestion: It looks like you are rating yourselves here. How about a guests page/section for the cook where guests could (anonymously?) rate critique the results. Hey Jono Bacon, How about no! So you can sit there and get annoyed when you are included on a mailing list about the Sonar Project, which by the way if successful will help millions of disabled computer users have better accessibility on the Linux desktop, which in turn, could help Ubuntu do the same, yet you feel it is more important to devote time and effort and event a blog post to something as trivial as a BBQpad! Sorry but someone has to say it. Jono Bacon, you are and A #1 DOUCHEBAG!! I think you just won that trophy yourself.